And so to the beginning. In my review, on this site, of Die Walküre in this series (Guild GMCD 2214-17), I dealt with the question of the conflation the two different performances therein, and which Richard Caniell, father and visionary of this 'Dream Cycle', sought to justify. Whilst that conflation brought together two broadcast performances, albeit from different venues, I was prepared to accept that the end product justified the means. In this Rheingold there is also some 'faking', for want of a better word, to bring the purchaser Caniell's vision of a dream cast with Kerstin Thorborg substituted as Erda in place of Doris Doe. Caniell justifies this not only on the basis of continuity with the rest of his 'Dream Cycle', but also that Doris Doe in the 1937 broadcast was �so disappointing'. This makes the Guild issue different from that issued by Naxos of the same broadcast. Caniell also claims to have found better transfers, used here, with considerably more overtones, albeit with more grit, and, sporadically, more surface noise. You pay your money and take your choice! The vocal quality of the cast lives up to their considerable individual reputations. Whilst I might have been over-generous to Schorr as the Walküre Wotan, here, three years earlier, he is nearer his peak as the outstanding singer of the part in the 1920s and 1930s. Rabich is an outstanding Alberich as is Branzell as Fricka. As to Thorborg's Erda (CD2 tr16), certainly the voice is clearly conveyed and steady, but who is the Wotan who sings first 'Wer bist du' and later 'Geheimnis- hehr'? I have to say the interpolation is only obvious in the reversion to the thinner, rather wavery, orchestral sound. That sound is the major drawback in this issue. The orchestra is set well back and often sounds thin, not helped by Bodansky's flaccid conducting which is not a patch on that of his more taut rendering heard in the Siegfried broadcast of the same year and which is also part of this 'Dream Cycle' (Guild GMCD 2207-2209). The booklet is up to the usual excellent standard of this series. 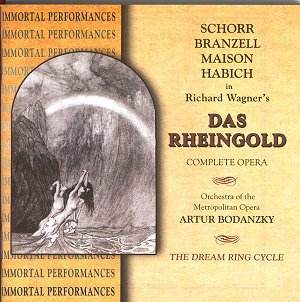 Although not attributed to Caniell it has a knowledgeable review of 'Ring' performances, of Rheingold, and Wagner and The Ring. There is also a track-related synopsis, good artist biographies and informative technical notes. Even more than other issues in this 'Dream Cycle', this is an issue which will mainly be of interest to Wagnerites used to listening to historical performances. Many will already have the Naxos issue, but, given its modest cost, will want to hear this set also. "Concept, texts, photos and their correlation by Richard Caniell." I had removed my name after each of the major articles in the booklet because I thought it was annoying to keep encountering my name after each piece. But, as an author, Id perhaps better go back to repeated accreditation rather than have my lengthy notes reported as not accredited (hence who wrote them?). broadcast), in order to accommodate my decision to have Thorborg sing Erda, I simply wouldnt have done it. It is Schorr throughout. About bringing in Thorborg, as my notes set forth, it wasnt only that Doris Doe was disappointing in the original broadcast, it was the fact that Thorborg sang Erda in our dream Ring Siegfried (1937), thus her essayal of the role in Rheingold would complete her traversal of the role. The same intention of completing each major singers essayal of the role led to bringing in Branzell as Fricka in the dream Walkre because she sang this role in Rheingold. This concept pervades the casting of the dream Ring. Perhaps Mr. Farr will offer a second view based on the facts I provide or, in the alternative, you might publish this letter. Many thanks for your interest in our series.